In the distant future a group of scientists were working on some experiments in their secret underground hideout diner shortly after 4:00 am. Through some unforeseen circumstances the scientists accidentally created a super-evolved intelligent sentient broccoli and other vegetables. Though the sentient vegetables were peaceful at first, they eventually turned on the scientists. Before the super intelligent vegetables were able to escape though, the scientists sacrificed themselves to seal shut their secret underground hideout in order to prevent an all out war on the surface. For their sacrifice a statue was built in the honor of the brave scientists. The previous story was one of the stories that was created while playing today’s game Nanofictionary. Nanofictionary is a card game where players are given cards for various characters, settings, problems and resolutions and they need to create a story utilizing them. While Nanofictionary can get a little repetitive at times, it is a fun creative storytelling game that will be quite enjoyable with the right groups. Sort the cards into four decks based on each story element. Shuffle each deck and place them in the middle of the table. Take the top card from each deck to create the discard pile for each story element. Each player then draws two character cards, one setting card, one problem card, and one resolution card. If there are less than six players, remove the extra number cards (starting with the highest number) and place them back into the box. Then place the number cards (with the lowest number on top) near the other decks of cards. The player with the shortest name gets to start the game. The first action that a player can take is to draw a card from any of the story element types and add it to your hand. A player can take any of the cards that have been discarded or the top card from any of the stacks. You then must discard a card from your hand (it can be a different story element). This player can choose to take one of the face up cards or one of the face down cards. The second action that a player can take is to declare that they have finished their story. The player takes the lowest number card still available and they take no more turns until the next phase. Each time a player takes a number card, all of the remaining players can add one card of any type to their hand. If the player is satisfied with their story they can take the top number card. The final action that a player can take is to discard their entire hand and draw an equal number of cards from the various decks. Once all but one player has taken a number card, the last player gets one more turn before the game proceeds to the storytelling phase. 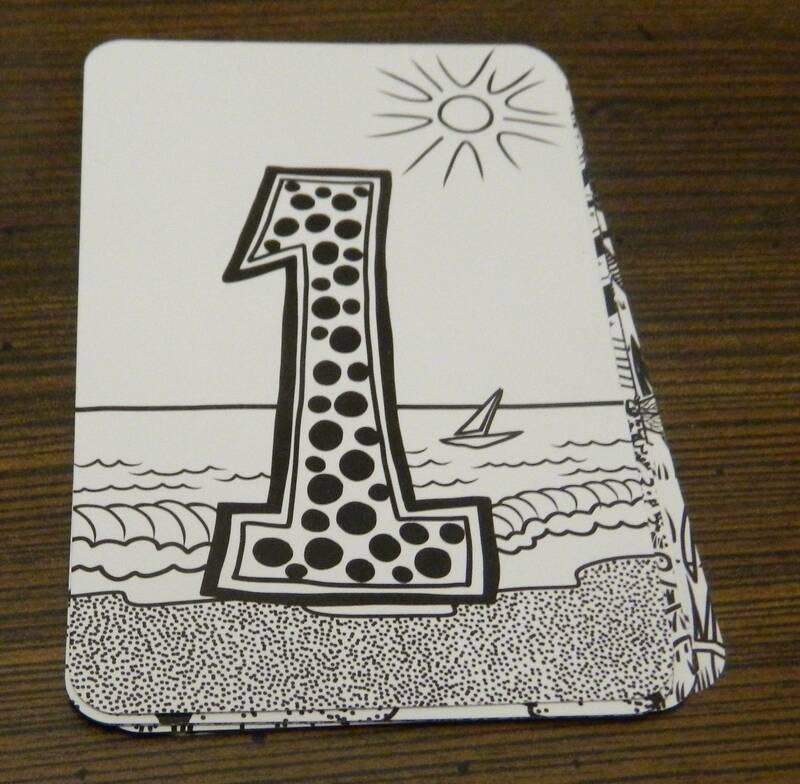 Starting with the player who took the number one card (followed by number two and so on), each player will tell the story that they created with their cards. While players can add things to their story that aren’t on their cards, the focus of the story should be on the player’s cards. When using cards players are able to slightly alter what is on the card. For example they can change the gender of a character or they can change the quantity of something mentioned on a card. If a player doesn’t want to use all of their cards they don’t have to but they need to use at least one card of each story element. This player has chosen to create a story about a distant city, a late night talk show host, a snake with a great personality, where a fight breaks out, but duct tape is used to save the day. After everyone has told their story it is time to vote. Each player gets one vote and no one is allowed to vote for their own story. When a player has decided what story they are going to vote for, they raise their hand. Once everyone is ready each player points to the player whose story they chose at the same time. Whichever player receives the most votes wins the game. If there is a tie, whichever player grabbed the lowest number card wins the game. Before beginning I would like to mention that this review is based on the 2017 version of Nanofictionary that will be released this Thursday (August 17th, 2017). 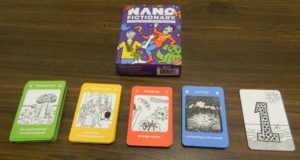 Prior to this release there have been two other releases of Nanofictionary. Nanofictionary was originally released in 2002 but was also re-released in 2013. Since I have not played either of these earlier versions of the game I am unable to compare the different versions but I am guessing that there are only slight differences between them. So I will get right to the point, Nanofictionary is one of those type of games where it is debatable whether it should even be considered a game. Nanofictionary does have mechanics and there is a winner and losers. Unlike a lot of games though Nanofictionary is the type of game where it doesn’t really matter who ultimately wins the game. While it is nice being the player who comes up with the best story, winning the game should never be the driving force behind Nanofictionary. If you are only focused on trying to win the game, Nanofictionary is not going to be a very satisfying experience for you. The best way to approach Nanofictionary is to look at it as something you play to have fun with your friends and family. You will get the most enjoyment out of the game if you and the players are just looking for a good time telling funny/enjoyable stories. With Nanofictionary being a storytelling experience your enjoyment of the game is going to depend pretty heavily on the creativity of your group. If most or all of your group is not particularly creative, Nanofictionary may not be for you. 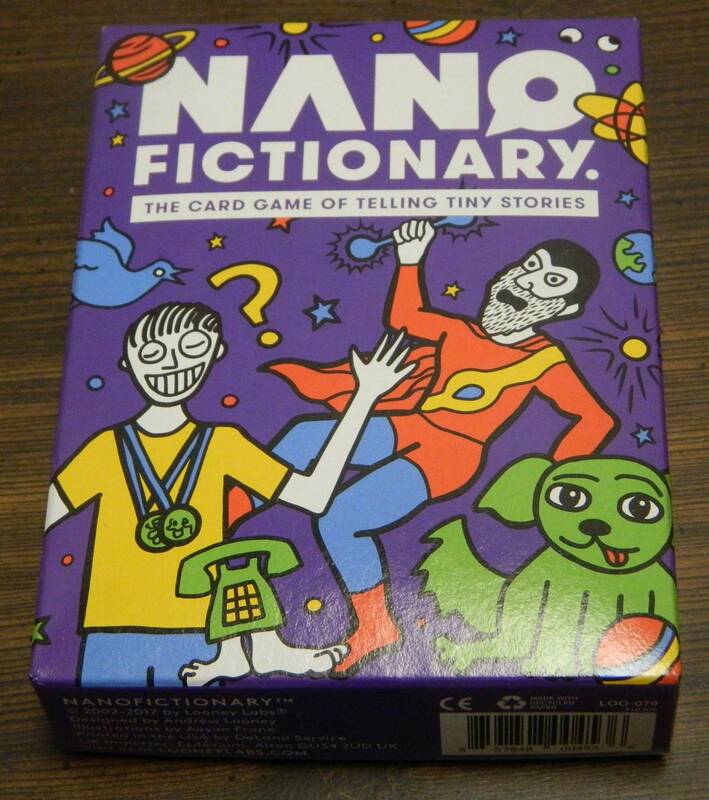 I can see Nanofictionary being pretty dull if most of the players struggle creating stories. The opposite is also true though. If you have a creative group that is good at storytelling I think you could have a lot of fun with Nanofictionary. Players who are great storytellers will probably be really good at combining the game’s cards to make some funny and interesting stories. Overall my group enjoyed our time with Nanofictionary. While our group is not the most creative, we were able to come up with some good stories that were able to get some chuckles. Probably the best story we were able to come up with was the “Great Food Wars” story I opened this review with. Despite not being the most creative people we were still able to come up with some good stories so I think creative people/storytellers could come up with some really good stories. For the most part the gameplay of Nanofictionary gets straight to the point. Basically on your turn you have a couple choices. First you can end your turn and then wait for the rest of the players to complete their turns. You can also choose to replace your entire hand which you might choose if you don’t like any of the cards that you are dealt. Most of the time though you will be using your turn to exchange one of your current cards for another card. This mechanic is solid but it does occasionally lead players to spend their turns digging through one of the types of cards looking for something that works with the rest of their story. This does sometimes make the rounds longer than they should be. With the mechanics being so straightforward the game is really easy to teach to new players. I would say that you should be able to teach the game to new players in just a couple minutes. The simplicity of the rules is a reason why I think Nanofictionary can actually serve an educational purpose. While I doubt the game was designed as an educational game, I can actually see it being educational in the right settings. For example I can see it working quite well in a creative writing class. I can see the game working well as an exercise to spur creativity in a writing class. While our group did enjoy Nanofictionary, the game does have some problems. While Nanofictionary is an enjoyable game, it is not really a game that you want to play for long stretches of time. I see it being more of a game that you want to play for maybe 30 minutes to an hour. After an hour I could see the game starting to drag a little as players will start to tell the same type of stories over and over again. I think Nanofictionary would work best as a game that you play for a short time and then wait a while to bring out again. Some of this is due to Nanofictionary not having as many cards as I would have liked. The 2017 version of Nanofictionary comes with 100 cards. 100 cards is quite a few cards but you can go through most of the cards pretty quickly. As players might end up discarding quite a few cards before finalizing their stories, you could probably go through most of the cards within two to three games. You obviously won’t be using a lot of the cards in this situation but you will be exposed to what is on the cards. With only 100 cards players tend to find cards they really like and then those cards get used in a story every time they come up. Other than not having enough cards I think the game’s component quality is solid. Basically if you have ever played another Looney Labs game before you should have a good idea what to expect out of the components of Nanofictionary. All the game comes with are the cards after all. 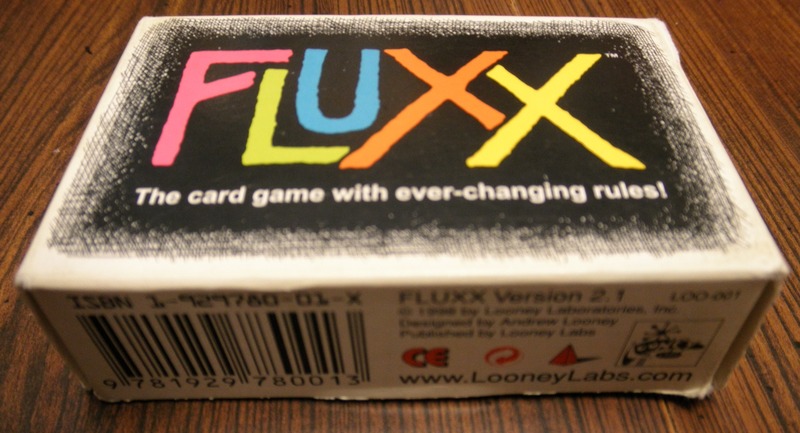 The card quality is similar to that of every other Looney Labs game. Overall I liked the cards’ artwork as it is pretty charming and works well for the game’s storytelling theme. Before wrapping things up I would like to talk about Nanofictionary compared to other storytelling games. In the past we looked at Tell Tale. Compared to Tell Tale, Nanofictionary is a considerably better game. There have been some other storytelling games created in the past though. Probably the most popular is Once Upon A Time which shares similar mechanics but seems to be a more competitive game as players compete to try and move the story towards their own ending card. Since I have never played Once Upon A Time before I really can’t compare it to Nanofictionary. While I would probably consider Nanofictionary to be more of a experience than a game, I still enjoyed my time with it. Nanofictionary is a quick and easy to play storytelling game which has a greater emphasis on creating enjoyable/funny stories rather than on who ultimately wins the game. While players are competing to tell the best story, the game is going to be more enjoyable if players are more focused on just having a good time. If you have a creative group you can get quite a bit of enjoyment out of the game. If you group struggles with creativity though, Nanofictionary might not be the game for you. If you aren’t really interested in the idea of a storytelling game, Nanofictionary is probably not going to be for you. If most of your group lacks creativity, I would also probably avoid Nanofictionary. If your group is pretty creative though and you are looking for a good storytelling game you can do a lot worse than Nanofictionary. We would like to thank Looney Labs for the review copy of Nanofictionary used for this review. Other than receiving the review copy we at Geeky Hobbies received no other compensation. Receiving the review copy had no impact on the content of this review or the final score. With the right group the game can produce some good/funny short stories. Fast and accessible for everyone. The game will suffer if the players aren't very creative. Best enjoyed in shorter doses.